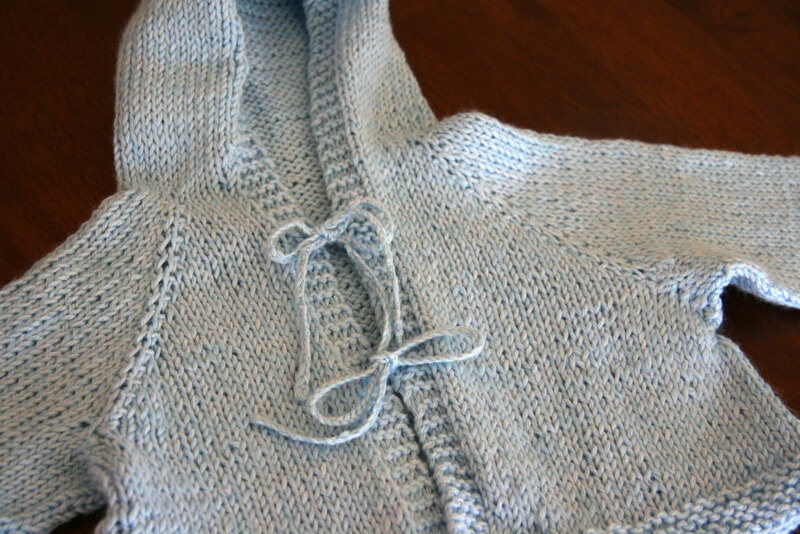 I just finished knitting a sweet little baby cardigan for a friend of mine. She’s expecting a little boy, and I am so excited for her. It’s not quite as blue as the color above, but it’s not quite as light as the photograph below. 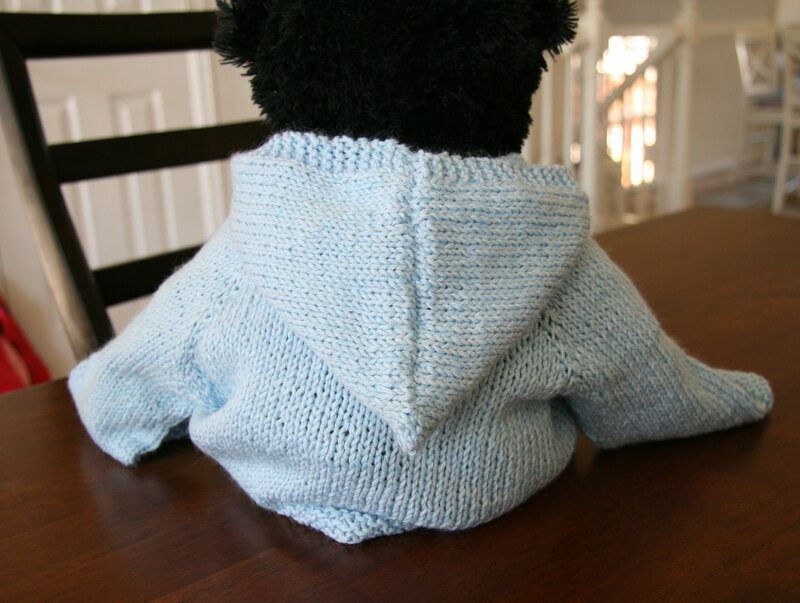 This is a free pattern called Easy Baby Cardigan by Diane Soucy. 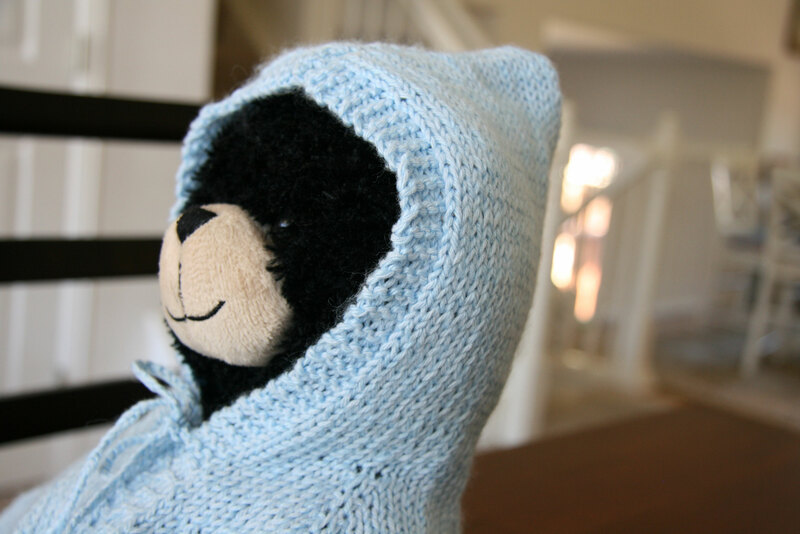 I didn’t have a sweet 6 month old baby to model this on so Winkie The Rock Star Bear served as my model. I love this little hood! It has little ties on the front instead of buttons or a zipper. At first, I wasn’t sure what I thought about the ties in this pattern, but I really like them. They are really easy to just quickly tie once you slip the cardigan on. I actually crocheted them as a simple chain. You could also do an i-cord if you wanted to. This is actually the second time that I made this cardigan. I started knitting again when Davey was about a year old. 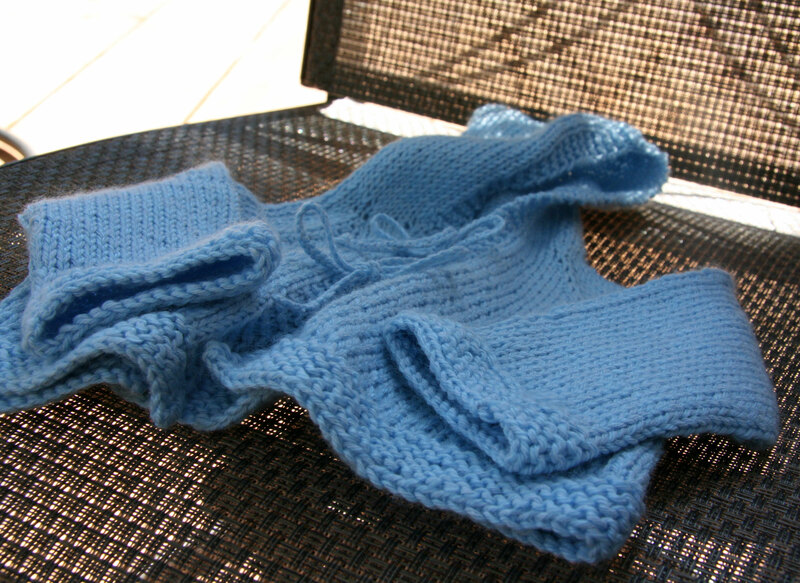 I made a scarf or two, then some houseshoes, and then I decided I wanted to knit Davey a sweater. It’s a great first sweater pattern. It’s really easy, although it was much easier for me this second time around. The first time I made it, I didn’t know about simple things like slipping a marker (SM) or slipping a first stitch. 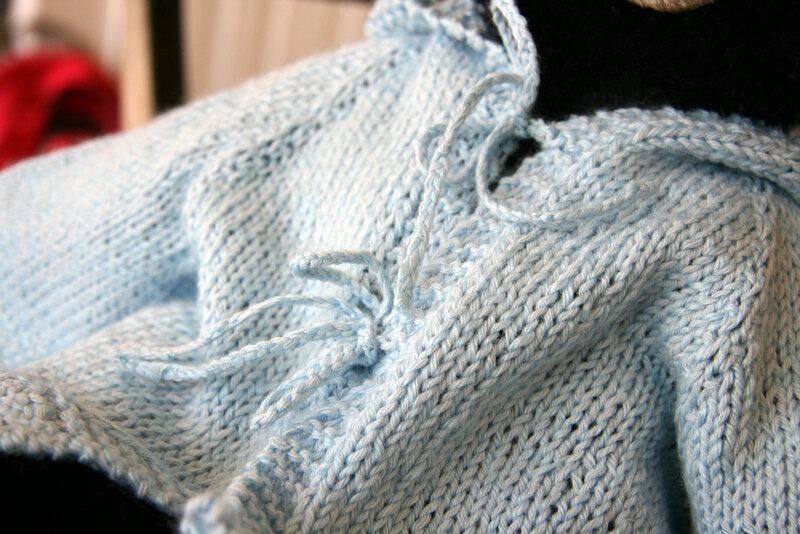 It seemed like I knitted and knitted and knitted forever before I got the back done. It turned out nice though, and Davey wore it quite a bit. 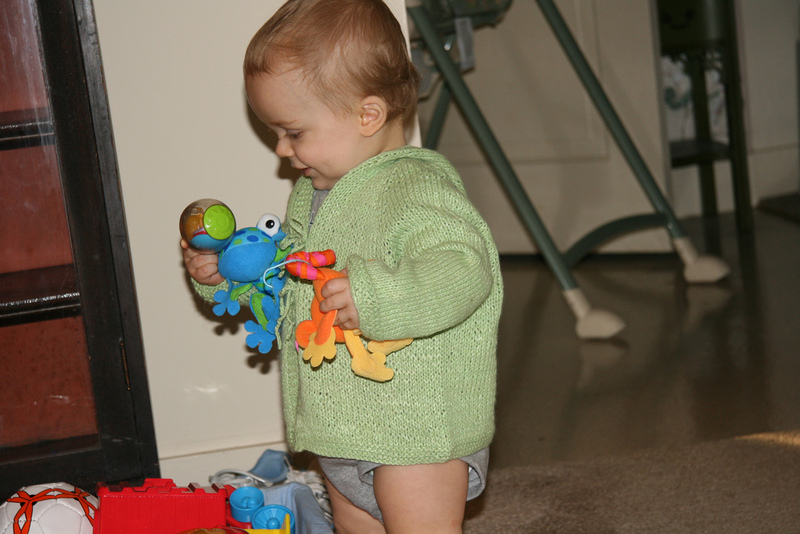 He was about 11 months old here and had just started walking I think. I made both of these with Little Lehigh Kraemer yarn. It’s a 55/45 acrylic cotton blend, and it’s really nice to knit with. Gosh, Davey sure is a little tot in these pictures! 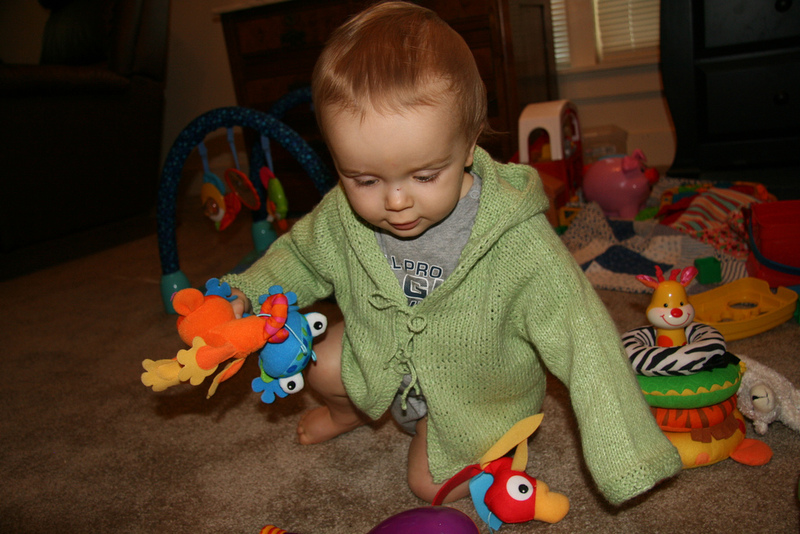 This entry was posted in Knitting and tagged diane soucy, easy baby cardigan, little lehigh kraemer yarn by cpeezers. Bookmark the permalink. That is an adorable sweater. I’m sure the new baby will get a lot of wear too. Davey still has that same inquisitive look to him. He sure was a cutie pie in those pictures! look at sweet little davey. i love the ❤ tree at the top of your blog.